The Chatham Anglers (2-0) cruised through the first round of the playoffs, sweeping the Harwich Mariners in the East Division Series. Now, the A’s will face off against the fourth-seeded Brewster Whitecaps (2-0), who swept the top-seeded Yarmouth-Dennis Red Sox in their first-round series, in the EDCS. Below are all the names, stats, trends, and history surrounding the upcoming series between Chatham and Brewster. Game 2 of the EDCS will be played at Stony Brook Field, a venue where Chatham has thrived this season. CF John Rave (Illinois State) — Rave, who batted sixth in Game 1 of the EDS and ninth in Game 2, has been Chatham’s engine in the playoffs. The Illinois native has three hits, two doubles, two runs scored and an RBI in the postseason. Monday, Rave’s single to lead off the third inning sparked a three-run frame that brought Chatham within two runs of Harwich. C/INF/OF Blake Sabol (Southern California) — Since moving to the leadoff spot in the batting order on July 27, Sabol has 13 hits in 33 at-bats (.394). Those numbers include Chatham’s two playoff games in which Sabol has already registered five hits and two RBIs. Sabol — along with Wareham’s Isaac Collins (Creighton) and Brewster’s Conor Grammes (Xavier) — is one of three Cape League players to bat above .500 with at least 10 at-bats in the playoffs. C/OF/DH Colin Simpson (Oklahoma State) — While Rave, Sabol, and others have been Chatham’s table-setters, Simpson has provided the knockout blow. In Game 2 of the EDS, Simpson raked three hits and knocked in four RBIs. In his last 14 games, the left-handed hitter has pushed 22 runs across the plate. OF Spencer Torkelson (Arizona State) — Torkelson wasn’t his usual self toward the end of the regular season. He tallied just four hits and one home run in Chatham’s final eight games. After going hitless with three walks in Game 1 of the EDS, Torkelson’s bat came alive in Game 2, slapping two hits, including an RBI single in the third inning that put the A’s on the board. LHP Jeff Belge (St. John’s) — Belge led the Anglers and ranked fourth in the league in innings pitched (35.2) during the regular season. He recorded the joint-second-most strikeouts (46) in the CCBL — only A’s teammate Alek Manoah (West Virginia) had more (48). The second-year Chatham player posted a 3.53 ERA in nine outings, the fifth-lowest mark among A’s hurlers with more than 10 innings logged. 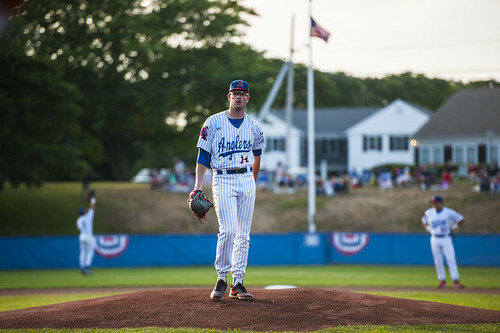 RHP CJ Dandeneau (Connecticut) — Dandeneau was an NECBL All-Star for the New Bedford Bay Sox before being activated by the Anglers on August 2. He has only pitched in two games for Chatham, but both outings have been impressive. First, he threw a scoreless inning against the Orleans Firebirds on August 2. Then, he picked up an eight-out save in Game 2 of the EDS to advance the A’s to the ECDS. RHP/1B/DH Tristin English (Georgia Tech) — English was slated to pitch Game 3 of the EDS, but the sweep means his first action on the mound will be in the ECDS. While the East Division All-Star was waiting around to pitch, he made an impact with his bat. His two-RBI single in Game 2 tied the game at five. On the mound in the regular season, he had a 2.31 ERA in 11.2 innings. OF Dominic Canzone (Ohio State) — An East Division All-Star during the regular season, Canzone has been a difference maker at the top of the order in the playoffs. Canzone was 5-for-9 during the EDS with two walks, a double, a triple and three runs scored. In Game 2 of the EDS, his leadoff triple in the bottom of the seventh sparked a rally of 11 unanswered runs over two innings. C Joe Donovan (Michigan) — After playing sparingly with the Wolverines in the spring, the rising sophomore backstop has made the most of his opportunity with the Whitecaps. Donovan led Brewster with a .309 batting average in the regular season and was named to the East Division All-Star team. Hitting in the nine-hole in the EDS against Y-D, he knocked two doubles in Game 2. His first double scored Cameron Eden (California) to make the score 4-0. His second double put him in position to score the game-winning run. DH/INF/RHP Conor Grammes (Xavier) — Grammes had one of his best games of the season in Game 2 of the EDS against Y-D on Monday. The Virginia native finished 4-for-5 with four RBIs, including a run-scoring triple in the first inning. Grammes has not pitched in the postseason but had a 5.78 ERA in seven games during the regular season. RHP Jeff Criswell (Michigan) — Criswell has been a solid bullpen arm for the Whitecaps over the course of the season. He pitched in 10 games and has a 4.33 ERA and opponent’s batting average of .233. In Game 1 of the EDS, Criswell picked up a four-out save to secure Brewster’s 5-4 win over Y-D.
LHP Reid Detmers (Louisville) — Detmers has faced the A’s twice this summer. On June 20, he took the loss as he gave up three runs on six hits in 4.1 innings pitched. On July 17 against Chatham, he threw four innings of four-hit ball in an eventual 8-6 win for the Whitecaps. LHP/1B Christopher Wright (Bryant) — It has been a tale of two summers for Wright. On the mound, he has been solid in six appearances. He has 21 strikeouts in 11.2 innings with a 2.34 ERA. At the plate, it has been a different story. He is hitting .187 in 75 at-bats with 18 strikeouts and only extra-base hit. At the end of the regular season, Brewster had a record of 13-27-4 with 30 points. Their 30 points are the lowest amount accumulated by a playoff team since the East Division Series was added in 2010. In total, only four teams notched fewer points that the 2018 Whitecaps — 2018 Orleans Firebirds (29), 2013 Brewster Whitecaps (29), 2010 Hyannis Harbor Hawks (28) and the 2013 Wareham Gatemen (19). Brewster's 13 wins are also the second-lowest total of the decade, behind the 2013 Gatemen. That Wareham team notched nine wins in 44 games. Heading into the playoffs, Chatham’s biggest weakness was its bullpen. Only two pitchers in the bullpen — Spencer Van Scoyoc (Arizona State) and Kyle Hurt (Southern California) — had been with the team the whole season. However, two recent additions to the bullpen helped close down both games of the EDS. In Game 1, Reeves Martin (New Orleans) entered the game in the top of the eighth and shut the game down. Besides two two-out singles in the bottom of the ninth with the Anglers up five, Martin shut down the Mariners. Since a bad first appearance against Y-D, Martin has been solid out of the bullpen, throwing five innings across the regular season and postseason and allowing only four baserunners. Coming into the game with a two-run lead, a runner on second and a 2-0 count to East Division All-Star Andre Lipcius (Tennessee), Dandeneau showed no fear. He pitched 2.2 innings of no-hit baseball, showing deft command of four pitches as he closed the door on Harwich’s season. Holliday called it a “special” outing for the right-hander. 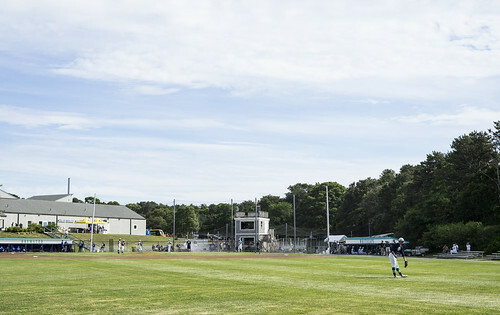 Despite tallying the fewest wins in the Cape League this season, the Whitecaps have had success against Chatham, with three of their wins coming at Veterans Field. In those games, Brewster outscored the A’s 27-8, winning two of them by at least eight runs. 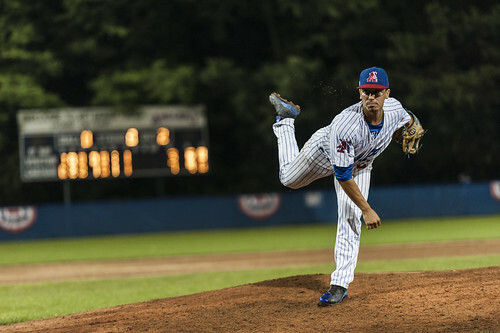 The Anglers had similar success at Stony Brook Field, crushing the Whitecaps 32-3 across a three-game span, two of which were shutouts. 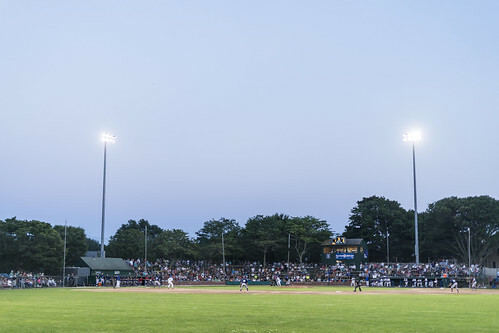 The final game, a 17-3 Chatham win, tied the 2018 single-game record for runs scored in a contest. The A’s scored a combined five first-inning runs in their three wins at Stony Brook Field, a formula that has often led to wins this season. Chatham is 10-4-1 when scoring a run in the first inning this season and 17-5-2 when scoring the first run of the game. Despite sweeping the Mariners in the EDS, the Anglers failed to score first in either game.